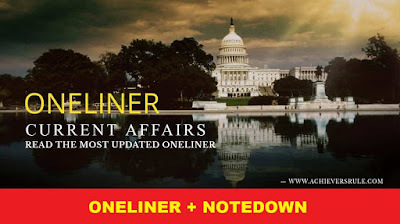 One Liner GK Current Affairs for 7th May 2018 consists of a list of news headlines based on the recent and Latest Updates. Each of these have been mentioned under its appropriate sections and we have added Static GK Note Down points at the end of the list which are important for the upcoming examinations of Bank, Rail, SSC and Railway. Aspirants should go through them in details and have a better understanding of the subject. To know in further details one can go through the Current Affairs Updates in a detailed basis. The Reserve Bank of India (RBI) unexpectedly announced it would buy Rs. 10,000 crore (1.50 billion dollar) of government bonds via open market operation (OMO), after failing to sell all the debt it had offered to bidders earlier on Friday. According to Asian Development Bank, India's projected GDP growth of over 7% for the current fiscal is "amazingly fast" and if this momentum is maintained the size of the economy can double within a decade. Niti Aayog and IBM has signed a Statement of Intent (SoI) to develop a crop yield prediction model using Artificial Intelligence (AI) to provide real time advisory to farmers in Aspirational Districts. Indian junior athletes clinched overall title in the 3rd South Asian Junior Athletics Championships (SAJAC) which concluded at Sugathadasa Stadium in Colombo on Sunday. Noted Marathi bhavgeet singer Arun Date whose iconic songs like Shukratara, Hya janmavar hya jaganyavar, Bhatukalicha khelamadhale, Asen mi nasen mi and Yeshil yeshil remain popular 60 years after they were recorded, passed away at his residence in Kanjurmarg.